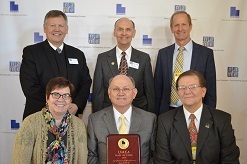 Utah Music Educators Association 2016 Hall of Fame Inductee! Click HERE to view all inductees. This site was created as a resource for junior high / middle school band directors. All of the information here is based on a book written by Larry Hill. Mr. Hill taught one year in Bancroft, Idaho, nine years at Orem High School and 25 years at Lakeridge Junior High in Orem, Utah. His bands consistently received superior ratings at district and state festivals. In 2003 he received the Outstanding Jr. High/Middle School Educator Award from the Utah Music Educators Association. In 2015 he received the Educator Hero award from The American Red Cross. He and his wife, Kay, have been enjoying retired life since 2006. Throughout the site, use the arrow buttons at the top and bottom right of each page (or the arrow keys on your keyboard) to move forward or backward one page. "I wish we could clone you and put you in every junior high in the district." "I would have to go a long way to find any greater [band program] in terms of teachability, discipline, response, and well-ingrained musicianship skills for this level." "You are focused on performance and success for every student. I really enjoyed visiting your class and observing such a masterful demonstration of quality teaching." "What a marvelous teacher you are!! I am so grateful that my grandchildren have had the opportunity to have had you as their teacher." "You're my hero! You obviously know something the rest of us don't know." "Mr. Hill, I'll come to your funeral."